Starters – or ‘Do Now’ – really helpful advice and examples! A year or so ago I wrote a post about Alex Laney’s Do Nows at Smith’s Wood Academy in Birmingham, England. 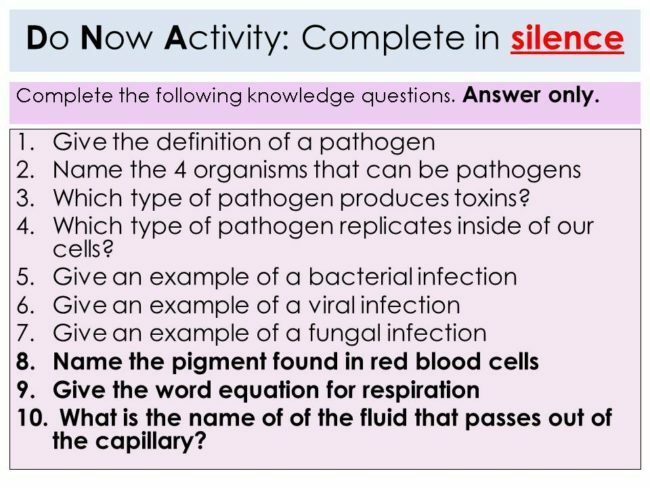 Since then Alex has kept in touch and he recently shared some insights about the school’s new approach to Do Nows or (as they call them) DNAs. Most notably, given the very compelling research on the importance of regular retrieval practice to ensure that knowledge is stored in long term memory and remains accessible there, teachers at Smith’s Wood have been advised that retrieval practice is the purpose of DNAs. “The schools policy is now that all DNA’s are intended exclusively to provide a venue for retrieval practice . This is what I feel our students need most,” Alex wrote. But Alex and his team then went a step further. Research in the cognitive sciences makes pretty clear that 1) the battle against forgetting begins as soon as you learn something and 2) the best time to practice retrieving something from long-term memory is when you have started to forget it- the fact that you must work harder to retrieve it but then do so successfully causes you to build a stronger neural pathway—memory essentially—of the thing you are trying not to forget. 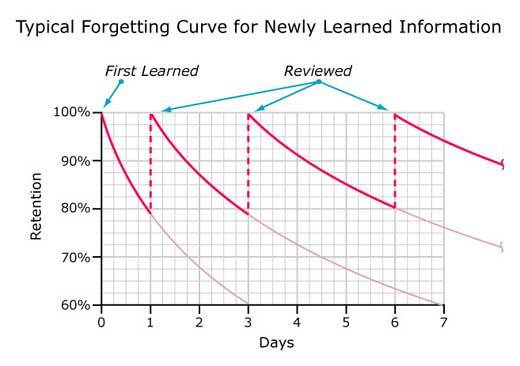 So Alex and company got a hold of a Forgetting Curve (at top)—which maps the rate at which people forget things they know—and asked teachers to not only use DNAs for retrieval practice and therefore make sure they retained what they’d learned but to try to practice retrieving information on different places on the forgetting curve—that is, essentially with different durations since mastery. 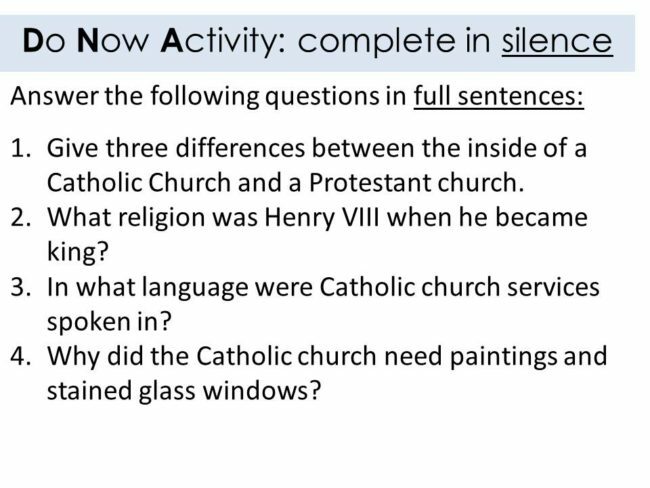 “We have given guidance that approximately 20% of questions on DNAs should be focused on learning that is two weeks or older .” You can see this in the example, below. The bolded questions are from a unit that is older than the un-bolded questions. “I want to get smarter with this,” Alex Noted. 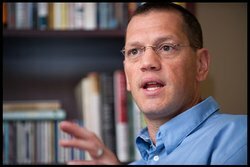 “We will eventually begin to track the content being tested in these recalls to better deal with retrieval and to stem forgetting.” In other words one of the new potential areas for data-driven decision making is studying the success of students in remembering thing relative to the placement of retrieval practice on the forgetting curve. A good summation from Doug Lemov on why ‘cold call’ is better than a random name generator. Cold Call, as you probably know if you read this blog regularly, is one of my favorite techniques- meaning that it’s one of the techniques that has the greatest potential to increase the rigor and engagement in a classroom. I also love that it can be used by almost any teacher and in concert with almost any other approach. You don’t have to change everything about your class to get the benefits. You can do what you do and add Cold Call to it tomorrow. That said, the details matter. Without them Cold Call can go wrong. Keeping it positive is one of the biggest keys to execution. I’ve written about it here. Managing the pause is another key point worth reading about (here). But there’s a particular point of confusion about Cold Call that’s common both in the US and in the UK that I’d like to address. Teachers sometimes conflate Cold Call with something known as “Popsicle Sticks” (in the US) or as ‘Hands Down’- sometimes ‘lolly Sticks’-in the UK. 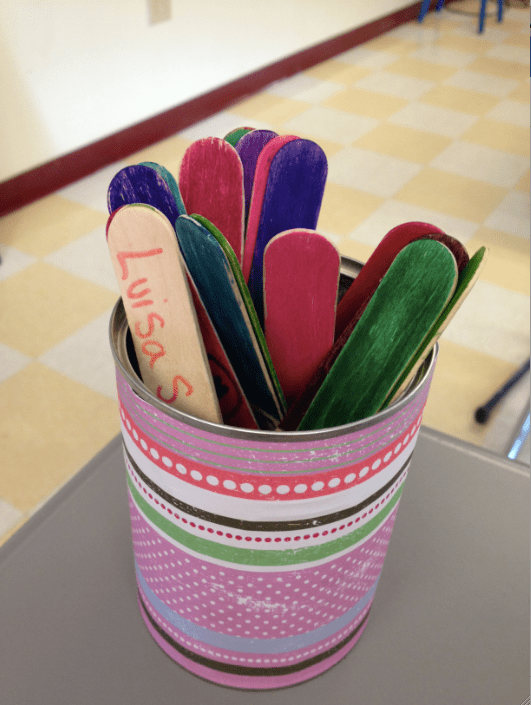 This involves telling students to lower their hands and calling on students using a random generator—names on sticks. Many teachers find it easier psychologically than Cold Calling and they often tell me, “Oh, I love Cold Call,” and then they describe popsicle/lolly sticks. I love a classroom where the expectation is that students may be called on at any time and expected to participate positively and I think Hands Down can do that so I don’t think that it’s necessarily wrong. But it’s not Cold Call. And I think the differences matter so I want to take a moment to explain why. In TLaC I describe the use of random generators (e.g. lolly/popsicle) sticks but I include it in Pepper not Cold Call. I did this because Pepper emphasizes game-ish-ness and energy but it’s not strategic. And sticks aren’t strategic. Intentionality—who you call on–matters a LOT. So does signaling intentionality to students. For example Matthew has been struggling to add fractions and just got one right. I want to Cold Call him to see how he’s doing and or let him succeed in public. Or maybe he just struggles and I think he needs more practice. So I route questions to him. Or I assign a bit of writing and Sabina has something very interesting that I want to use to start discussion. So I call on her even though her hand isn’t up. Or maybe I want to Check for Understanding and take a statistical sample of my class—deliberately asking kids that I think represent where the class is generally. There are a million reasons why who I Cold Call when is important. If I use popsicle sticks there I lose my opportunity for strategy. Even if I don’t have a reason to Cold Call a specific student in a specific situation, using a random generator makes it explicit that I am not making intentional decisions about who to call on. It says: ‘I am not choosing intentionally’ and this too is a loss. For example, one of Cold Call’s biggest benefits is its inclusiveness—it says, implicitly, “I care about your ideas and would be interested to know what you are thinking right now.” To say: “David, what are you thinking?” tells David that you value his opinion and are thinking about his perspective at that moment. To use sticks is to say—‘It’s all about the same to me.’ It means there is nothing special or personal about being asked your opinion. ‘You’ve been picked from the pile,’ is very different from ‘i want to hear your thoughts’ as one teachers put it. That to me is a HUGE difference. Additionally, one of the primary purposes of Cold Call is to build student engagement, to involve students in class and to have them want to be involved. We see this all the time in our workshops for teachers, interestingly. If one of us Cold Calls someone—positively, thoughtfully, genuinely asking what they think—we invariably see them start to raise their hand more frequently. People are often a bit shy to speak up in a room of 120 or so but once they do it and feel success, well, they are in. We’ve made a hand raiser of them. It’s similar in the classroom. Kids find they can do it and then they start to raise their hands. This is a key point about Cold Call. I don’t want to ONLY use it. I want to balance it with taking hands because I want students to want to raise their hand. To raise your hand is to CHOOSE to participate, to want to speak. While Cold Call is immensely valuable, this, too, is valuable. So while it’s sometimes fine to say “hands down” I also think there are times to 1) just take hands or 2) let kids raise their hands and call on some hand-rasiers and some non-handraisers. I can Cold Call to build accountability and inclusiveness but then also reward passion and enthusiasm. I have seen video of classrooms where students respond to chronic use of hands down with anger. ‘Why does it have to be random? Darla doesn’t even want to speak and I am burning with an idea.’ As a teacher, I don’t want to lose the ability to balance accordingly. One other key difference is efficiency. Getting out the popsicle/lolly sticks takes time. Each time you pull one (“Oh, boy! Let’s see who it is! Whoops Jaden’s not here….”) takes time. And it interrupts the flow of normal conversation. It’s hard for Amari to build off and elaborate on Janet’s point if there’s a circus of stick pulling in between. As a bonus I thought I’d share a recent clip of ace teacher Jamila Davis Cold Calling. Here interestingly, she’s just focusing on making sure her kiddos understand the task. But look how efficient and positive it is, how she can Cold Call while she’s doing something else. And how the energy it creates sets her students up to read on their own with energy and engagement. Jamila Cold Call from Uncommon Schools on Vimeo. By the way one other benefit of letting students raise their hands is that it is an outstanding source of data. I ask a question and just 2 or 3 students raise their hands- that tells me something. Especially if I’ve built a culture of students wanting to raise hands. Now I have important data that much of my class is stumped. Similarly if I ask a question and everybody raises their hands I think: hooray everyone in engaged but maybe if everyone thinks they can get it I need to start adding to the challenge of my questions, etc. So…. can Hands Down or ‘popsicle sticks’ be entertaining to occasionally use? Yes. Can these approaches bring a bit of ‘game show’ to your classroom from time to time? Yes. Should you stop using them altogether? No. My point is that from a learning perspective they are not nearly as valuable as Cold Call and that teachers often assume they are a form of Cold Call or achieve the same ends and value as Cold Call, which they don’t. I have listed here the 49 techniques that ‘put students on the path to college’. These techniques have proven it is possible to close any perceived achievement gaps (details can be found in the book, and I am also working on a simplified version for staff and will post on here). I will put video clips on the network shortly and post a link.